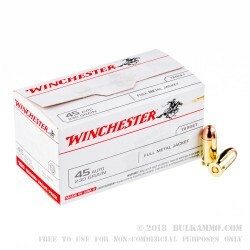 This Winchester “white box” ammo is a highly popular option for training thanks to its solid quality and availability in bulk packs like this 100-round box of .45 ACP. 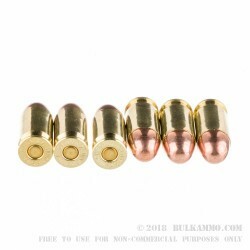 This load fires a 230 grain full metal jacket bullet at a muzzle velocity of 910 feet per second, typical for the .45 Auto cartridge. 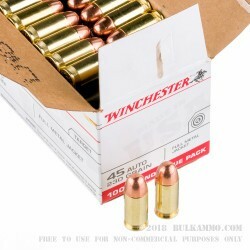 Each round in this box uses Boxer primers and reloadable brass cases. Winchester is a division of the Olin Corporation, a manufacturing conglomerate founded in 1892. 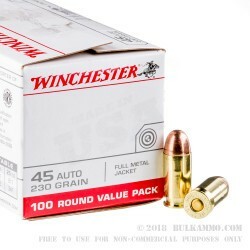 Winchester itself dates back to 1855, when it was established as the Winchester Repeating Arms Company. After spinning off its firearms business to licensed producers Browning and FN, the company currently focuses on producing its highly popular Ranger, PDX1, and Silvertip hollow points as well as its ever-popular range ammunition line. Update on previous post, problem seems corrected.